Deja Vu, Coincidence, Take your Pick. I told You it's All in the Mind. It's All in the Mind (Forever). I'm Not a Happy Chappie. Lost, or was it Forgotten. Yet another week with murder featuring in the tabloids. Knife crime in Britain, though disturbing has become so common it hardly makes the headlines. Bodies found in a burnt out mansion in Shropshire is more unusual and is more avidly read. One cannot but notice the response of locals interviewed by the press. "It's not the sort of thing we expect round here" and "he didn't seem the kind to get involved in that sort of thing" are the sort of comments bandied around. Which begs the question, "Are murderers different to anyone else, particularly ourselves, and why do we think it's only other areas that are susceptible to murder?" Could you, yes you, dear reader, recognise a prospective murderer. For they don't have 'murderer' stamped on their foreheads. Stand up the person I hear muttering "More's the pity." You might think that you need to lead a highly unusual life, or live in exotic places in order to meet exceptional or unusual people. You would be wrong. Look around, listen, watch; they are all around you. I used to think murderers are only to be found in the tabloids, or on Coronation Street, but I was wrong, hopelessly, wrong. I met Bill because of a shared interest in English Bull Terriers. He was a hard, worldly northerner, particularly conversant with the machinery needed to illegally extract gas from a gas metre at no cost to the householder. We would exchange pleasantries at the local flea market on a Tuesday evening. That is, until Bill went home one evening, found his brother in law fast asleep on the settee, took his chance and cut his throat from ear to ear. There was a complicated history behind this horrific act, Bill in fact received only a short prison sentence and eventually returned to his native Newcastle. Thus our little chats ended. I used to see Harry at a local residential hospital for people with mental as well as physical problems. I taught English in a large comprehensive school and also ran a scheme that involved school pupils working within the community. Harry, a Welshman thirty-two years of age, was a voluntary worker at the hospital one day a week. Harry was good at the work, compassionate, caring, popular. We shared tea, crisps and cakes on our regular, if short meetings on a weekly basis. Until Harry eventually returned to Wales, his sentence served. For Harry was on licence from a local prison for a murder he had committed thirteen years previously, when, at the age of nineteen, he had killed a man in a street brawl. Grant was a pupil in one of my English classes. Average academically, he would probably have been quite successful had he shown more interest in the work set, instead of doing the bare minimum on a good day and nothing at all when he felt so inclined. Tending to be cheeky, with the distinct ability to disrupt a lesson at will, he was no model pupil. Nevertheless I quite liked Grant, as he was normally a cheerful individual, even his disruptions were accompanied by a humour that made his behaviour almost forgivable. Several years later Grant was involved in an incident with another customer in a public house. Exactly what happened I know not. What I do know is that Grant left the public house, returned with a knife and killed the person who had upset him. An infamous action not exactly designed to put his name in lights on the wallboards in the school’s hall of fame. Cyril used to walk past the school where I worked. I admired his fortitude in the face of adversity. Probably only in his late twenties, fate had been somewhat cruel. Severely injured in a road accident, he was left with only one arm and a leg that required a brace to enable him to walk at all, albeit with difficulty. Unable to find employment, the highlight of his day was accompanying his daughter to the infants and junior school down the road from his home. A task he accomplished with distinction for many a year. That is, until the house next door to Cyril’s was discovered ablaze, the old lady who lived there dead in a downstairs room. The murder, for the old lady was indeed murdered, remained a mystery for only a short time. Cyril was duly arrested, charged and convicted of the murder on irrefutable evidence, resulting in a life sentence, and an existence inevitably devoid of the trials and tribulations of walking to school on dark winter mornings however inclement the weather. My children, and indeed some friends reckon I'm somewhat bizarre having 'known' at least four people who have committed murders. I tell them I'm just an ordinary individual passing quietly through life. What do you think? The newspapers are full of American plans to build missile detectors in Poland, dubbed by some Son of Star Wars; Russia naturally is not amused. I watch representatives of both countries on Newsnight. The elderly US senator is smug bordering on facetious. the Russian representative is intellectually his superior and comes over better even if he is speaking in a foreign tongue. Do you remember in days long since past when you went to the cinema. You often arrived half way through the main feature. Then came the adverts, plus a newsreel and often a second film. The main film began and sooner or later you reached the point where you came in. All this talk of confrontation, nuclear problems and escalating threats remind me of the past. Continually going round and round, just like our youthful trips to the cinema. I distinctly remember being told that there would be another great war in four years time. This at a time when the Second World War was very fresh in our minds. I would be nine years old and worked out that I would have achieved the ripe old age of thirteen when the calamity arrived. A teenager and a war, what excitement. Obviously I had no real conception as to what such events entailed. The possibility of war and global escalation was in the background throughout our formative years. The Korean War, the Suez Crisis, the Cuban Affair are just some of the events that added to the uncertainties of the post war world and seemingly nothing changes. The point is that the nuclear threat has been in the background all of my sixty plus years. I taught in a comprehensive school in Derby throughout the 1970's. It was a three storey building built in the sixties. Attached to a roof within feet of a classroom in which I constantly taught was a siren. This siren was tested every six months. Its monstrous, ear shattering, mournful wail stays in the mind forever. Evidently it was to be used in the event of attack by an enemy. Exactly whom I never did find out. Neither did I ever find out who authorised its position on the roof or its sounding off. I certainly wasn't asked or informed even though I lived and worked locally. Did it eventually fall into disrepair or did policies change. Apparently ours is not to reason why. Its a wonder the population grows up in the main sane and sensible. We did discuss seriously in class on occasion the world and its problems. But sometimes you have to step back from it all if you are to assume we all have a future, particularly important where children are concerned. We would discuss the terrible effects of Hiroshima and Nagasaki. The effects dwarfed by modern nuclear weapons. "And what do you reckon, sir?" would be the question. This at a time when the talk was always of the warning of nuclear attack being four minutes. So much for the siren on the school roof. Just time to boil an egg and very little else. "Well children, this is what you do. Dig a hole in your garden around six feet by two feet by three feet deep. Put a pile of leaves and a rake alongside. When you get the warning that a nuclear attack is imminent, and it will come by the siren, the radio or television, run into the garden fast. Quickly lie down in the hole and with the rake pull the leaves on top of you." "Well, children, sorry to say, it won't make any difference to the effect. But it will leave the place tidy for the next lot!" The weather is appalling for this time of the year and my bones ache with the constant moving of everything from fridges to garden ornaments. Add the effects of antibiotics for a painful infection and I confess I have felt better. I am definitely feeling my age. Except I am unsure how my age, sixty eight should feel. I was at th e first match of the new football season, Derby County versus Doncaster Rovers. It was a dreadful match and we lost, nothing new there. We, the supporters commiserated with each other. An elderly gentleman sitting behind me suggested it was as bad as he'd ever seen. Now it's very common for supporters to reminisce about the 'good old days' but he seemed more knowledgeable than most. Plus mention of 1930's players he had seen was surprising. "Would you mind telling me how old you are" I ventured. The gentleman was evidently a mite bit deaf, for his companion, evidently a mere seventy five years of age spoke for him, proudly informing me his companion was ninety six. There is a walk from the car park and stairs to climb to our seats in the stands, no mean feat at so great an age. Not to mention the stress of following a team that has failed to win in its last thirty plus matches. Plus both men had been farmers, far from an easy life I would have thought. We had an afternoon at Foremark Reservoir, a local beauty spot to get away from the 'removal blues'. I commented to an elderly gentleman sitting in his car that there were worse places to be. He volunteered that he came four times a week including winter. "I've been coming for many years" he said. "I miss my wife coming with me, I'll be ninety one next birthday." A sad situation but a grand old man, an ex-milkman he told me, battling on in spite of life's trials and tribulations. I was in a village in Lincolnshire gathering material for a magazine article. The sign 'Lordship Way' looked interesting. The banging from a nearby building attracted my attention. I wandered into the open door and in the gloom saw a small elderly individual, cigarette dangling from his mouth enthusiastically wielding a large hammer. "Excuse my interruption" I called across the forge, for he was obviously the blacksmith, "but could you tell me how Lordship's Way got it's name." He thought for a while. "Well, my father were here before me, and I've been here since 1926." He lapsed into further contemplation. "And do you know" he answered triumphantly, "I've no idea!" I looked at the old man with disbelief. Surely his maths were suspect. Again the question, "Excuse me. do you mind telling me how you are." "Ninety three, I were born in 1913." It was obvious there was nothing wrong with his intellect or his maths. I thanked him for his time and stepped out into the sunlight. Leaving a remarkable man to the smoke filled forge and more than likely another cigarette. I still visit the village where I lived for the first twenty five years of my life. Until a year or two ago I still saw on occasion Miss May. The last I heard she is in a nursing home and will be over a hundred years of age. May drove her small car until she was I believe ninety eight years of age. May did not travel great distances but visits to the local Asda at Spondon meant negotiating roads that challenge the most experienced of drivers. May coped admirably in her own way, others seemed more concerned than she was. A mutual friend who accompanied her on her travels once told me " I pray when I get in the car and I give thanks when I get out!" The village is quiet by city standards but still needs care if accidents are to be avoided. At ninety eight years of age Miss May was reprehended for driving too fast through the village. Shortly afterwards May gave up driving; I would imagine many people gave a sigh of relief. It's not funny really but how many of us would settle for being told off just short of our hundredth birthday. I cannot remember why I chose to give up the tenancy of the house adjoining the Eagle Club. I was not ejected so I probably left willingly. So began a hectic four years or so of frequent moves than would have been anathema to someone more domesticated. In truth the job tended to take over my existence in the main but life also revolved around drinking in local pubs, joyful ownership of a Mini Cooper S and sundry friendships with various young ladies wherever possible. A typically selfish existence of a single young male but harmless in the main. My domestic situation was often fraught but passed over my head, so to speak; probably a good thing in the circumstances. I lived for a while with a widow and her two daughters. (The aunt of a good friend, Stuart.) I only vaguely remember the daughters, honest if not the aunt, but it was good of them to provide me with lodgings. I lived also for a spell with a church curate and his wife, moving in for days and staying weeks. Similarly I moved in with a fellow youth leader, John, who already had a wife and four children at home. This time the stay became months rather than weeks. If there were other arrangements I have forgotten them, except for the strangest move of all. For several months I lived in a loft come room virtually above the toilet in the youth club. Entered via a loft ladder and a hinged trapdoor, the room measured approximately seven by seven feet, plus the ceiling sloped making standing up difficult. I only slept in there, having the run of the rest of the club outside opening hours. This arrangement lasted several months, was free of rent and my presence was unknown to most. Many a mid morning the phone would ring and the septuagenarian part time caretaker would inform my 'boss' in the town hall that I had just popped to the shop for a newspaper, his bellowing up the ladder, "your boss wants you" signalling it was time to leave the sleeping bag I had installed in my cosy retreat. My whereabouts were even unknown to the church committee to whom I reported on a monthly basis. The club had of course all that I needed for a basic existence, showers, toilets and cookers, a veritable palace for a single man. I had one other abode during my spell as a single man in Chesterfield. I lived as a paid lodger with a Mrs Sherwood, a widowed professional lady, a pleasant if formal arrangement. What I did not know at the time was that Mrs Sherwood was the grandmother of a young lady who would put paid to my existence as a mobile, fancy free bachelor. A strange thing seems to have happened. I cannot, at this moment in time recall any instance or happening that I have not already committed to print. I must explain that I have already stored, so to speak a substantial autobiographical work that I wish to publish at a later date. Containing everthing I can or wish to remember up to the end of my teenage years. Therefore virtually everything I write concerning those years I am retrieving rather than considering for the first time. Plus much of this blog already touches on life in the sixties to the present day. Nevertheless what has surprised me, in view of my 'everything is stored in the brain' belief is that I cannot recall anything new so to speak. Another theory seems to bite the dust. Am I losing it; has my TGA taken its toll; am I experiencing mid life crisis; am I doing too much and need to slow down. Or am I just another silly old devil who, nearer seventy than sixty needs to stop playing the old philosopher and get on with enjoying life in general. I'll settle for the latter! I was eating breakfast recently, bacon and egg when I felt something unusually hard in my mouth. I manoeuvred it away from the food, retrieved it and was surprised to find the tip of a very sharp knife. Unusual and potentially very dangerous, large enough to do serious damage to ones inners. It must have been my lucky day, so to speak and undoubtedly luck plays a part in our lives. Some believe in Fate, everything in life being preplanned but that is not a theory in which I have any conviction. When I wa s around fourteen years of age I used to join others, some older near the river at Spondon, Derbyshire. The other boys swam, the water was both warm from the power station emissions and deep. I was a non swimmer at the time so amused myself in other ways. One day I crawled out on a tree trunk and fished dead fish from the water with the aid of a long stick. (The fish were killed by the sheer warmth of the power station discharges.) Only the tree trunk was dead, broke as I reached the point farthest from the bank and pitched me into the water. I was down stream from the swimmers but someone, I can't remember whom immediately spotted my plight and unceremoniously hauled me to the bank. No damage was done, except to my pride and I spent the next hour sitting on the riverbank naked, to my embarrassment and passing train passengers amusement. In the same era, two miles down the river, at Borrowash a young boy and his father fished. The river was high, the young boy fell into the river, his father went in after him and both died. Stark contrast to my lucky escape. I recall both instances clearly as a result of my 'breakfast' incident. But in a way they don't count as random recall, I have written of both instances before in an autobiographical work I intend to publish at a later date. But it brought to mind an incident from the recesses of the mind long forgotten. We had as visitors all of thirty years ago, a friend and her son aged around six, the latter a pain of some significance. He lacked the proverbial 'common sense', had a short attention span and took some watching, so to speak. I noticed he had one of our daughters glass marbles but thought little of it until he embarked on a coughing fit of some proportion. Red in the face and apparently choking his last breath he was an alarming sight. I quickly assessed the situation, grabbed the young man by the feet and hauled him upside down while my wife rapidly thumped his back. He was not amused, coughed ever more, his face even redder, no matter, that we were saving his life. Only beginning to despair we were too late, I glanced to one side and espied on the floor one shiny glass marble he had lost interest in minutes earlier. He never did visit us again and I noticed he was in the local papers on occasion in later life for various petty criminal offences. I hope his treatment at our hands was unconnected with his future development. Three recalls in three days. Now it gets interesting. Is my old damaged brain up to it I wonder. Teaching was okay as a profession but occasionally it became repetitious and we found distractions to 'pep up' the mundane nature of the lessons. I once borrowed a glass eye, from whom I cannot remember. I found it fascinating, probably in part because I have one eye that is rather 'duff' to say the least. It was discoloured round its edges, the glass eye that is, some sort of unknown stain that added to its magic. I took it into a lesson one day. I set the class a written test and walked round the classroom. I then proceeded to sc rew up my face as I pretended to 'lose' an eye. "Get on with your work" I commanded the class as I searched round the floor for the 'missing' eye. On 'discovering' it under a desk I triumphantly recovered it, held it aloft and, with my back to my audience, returned it to its rightful place. Dreadfully politically incorrect, I know, but the class were amused (I did eventually let them in on the act) and I'll bet it was one of the few lessons they remembered from my seventeen year career. 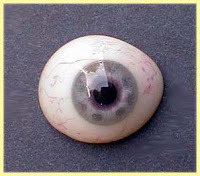 I also took the glass eye home to show my wife. She was quite unimpressed by it, it gave her the shudders. Then she held it up to the light. "What are you doing" I enquired. Evidently she was looking for the hole as she couldn't imagine how they could see through it without a hole! I've never let her forget, bless her. Some may consider Harry Lorayne's book naff, but it's got me thinking. I believe everything we have ever experienced stays in the mind forever, at least whilst we draw breath, so to speak. The brain is cleverer than any computer and seems endless in its capabilities. Its merely a matter of recall; but easier said than done sometimes. Beyond that I have no idea, there again I never was a threat to Albert, Einstein that is. Nevertheless I'm going to conduct a little experiment over the next four days. I'm going to try and recall four events, unconnected, of little importance, but events hopefully I've not recalled for some considerable time. Unscientific, of no value to anyone but, heck it may interest me! I remember visiting Skegness as a child and being fascinated by an exhibition concerning Japanese atrocities towards British and Commonwealth troops in WW2. Cost, sixpence, showing hangings and decapitations. The exhibition ran for several years. Who ran it, I wonder and when did it finish. Presumably it was done so that people would not forget what happened during the war. I remember as children we would inflict cruelty on insects, spiders, ants and the like. We would pretend they were German or Japanese soldiers. Remember we were children brought up in the aftermath of war. It's surprising in a way that we finished as normal as we seem to be. Though some might disagree concerning our 'normality'. One final thought. Fighting between Georgia and Russia is constantly in the news at the moment. Has this prompted this recall I wonder. We have transported to our new home over one hundred boxes containing our possessions, a proportion of which can only be truthfully labelled as junk. Surprisingly a large proportion of the boxes contain books. (Books are also amazingly heavy in bulk thus the amount of boxes needed steadily grows.) I stop and read frequently as I unpack, thus the unpacking rate per hour is painfully slow. To my surprise I rediscover a book I thought I had lent to someone only I couldn't remember whom! Called, ironically 'How to develop a Super Power Memory' by Harry Lorayne, published in 1958, it fascinated me as a twenty year old trying to impress. It has presumably been in the loft and emits a strong smell that is probably smoke from our wood burners via the chimney through the loft. Nearly fifty years on I study its pages and wonder at its original attraction. It is full of 'memory tricks' or aids to a good memory. He explains the 'Link Method', 'Peg Systems' and memory by 'Association'. Plus there are numerous quotes to emphasise the importance of having a good memory. 'The true art of memory is the art of attention.' Samuel Johnson. 'A man's real possession is his memory. In nothing else is he rich, in nothing else is he poor.' Alexander Smith. 'All knowledge is but rememberence.' Plato. Memory is 'the treasury and guardian of all things.' Cicero. Lorayne evidently believed that the memory is like a muscle and must be exercised and developed if it is to give proper service. It has no limit as to its capacity and there is no such thing as a bad memory. Evidently Lucius Scipio could remember all of the people in Rome; Cyrus could call every soldier in his army by name; Seneca could memorize and repeat two thousand words after hearing them once. So no excuses, get yourself a 'memory book' and you too will develop a super power memory. But time is money as they say, now what was I doing when I allowed Mr Lorayne to distract me! One thing is for certain, he certainly did not suffer from TGA. I enjoyed Mr Lorayne's book and can't resist repeating the beginning of his chapter What's in a Name. 'This fellow was very proud of the way he could remember names by association, until he met Mrs Hummock. Mrs Hummock was quite heavy, and had a large stomach, so he decided to use 'stomach' as his association. Three weeks later, he met the same lady, glanced at her stomach, and, feeling very pleased with himself said, "Good day, Mrs Kelly!" Can you believe I had to get my wife to explain! I've just been 'thwacked' by a car and caravan travelling in the opposite direction, one new mirror now required and boy oh boy do I feel a grump coming on. Now I know he's arguably as much right on the road as my none too tiny motorhome but does he really need mirrors on mile long sticks. Obviously a rhetorical question. Of course he needs them when his motor is five feet wide and his caravan's seven feet six. Mind you, it would have helpful if he'd stayed on his own side of the road. Don't get me wrong, I've nothing against caravanners. I'd even go so far as to award them their own time to travel. How about one to three am. It's not as if they'd be lonely as they seldom travel alone. When I was a trailer tenter I was quite worried as I was unsure as to whether I was now under caravan rules. I had no friends to travel with and I wasn't sure if I was allowed out on my own. I did think of waiting for another trailer tenter to pass and tucking in behind but I was unsure as to whether this was ethical. Plus my inexperience of 'driving in pairs' would be embarrassingly obvious. For instance, when an ordinary mortal decided to pass me, how would I know when to accelerate in order to close the gap between me and my friend in front. Are there books on driving in pairs or do you learn by experience. Then there's the experience 'on site'. Never mind if your fellow caravanner couldn't travel with you. Just save his place alongside your pitch, anything movable will suffice: fire bucket, chair, your car, all warn fellow travellers you've got a friend coming. Who probably lives on your street, works with you and you haven't seen since half past four and it's now six o'clock. Besides, it wouldn't do to have to walk half way down the field when you've got so much to tell each other. Grump over, the last one for a while. There must be many 'nice' caravanners who are acutely aware of their fellow travellers. Have I just been unlucky. You tell me. I obtained the post as Warden of the Eagle Centre, a church run organisation in Newbold, Chesterfield in 1965. I was brash, enthusiastic and single. The centre was home to various groups, my home was the adjoining house next door. Completely undomesticated, I survived, and I choose the word carefully on tinned Irish stew, complete meals in vogue at the time in tinfoil trays, including roast beef and Yorkshire Pudding and chips and chicken from the local 'chippy'. Plus dinners at both the YMCA in town and the local C of E junior school (the latter on provision that I did not eat left handed as the head suggested it was a bad example to set children). Also various meals with sympathetic parishioners who perhaps not coincidentally often had spinster offspring of a higher than average age. Tidiness was not a strong point though I did occasionally wash up (hose piping a weeks pots in the sink was not unknown) and some of my washing and ironing was delegated to Christian ladies in the congregation who were sympathetic to my plight. (Until one day a pile of immaculate washing and ironing was returned in the middle of a hectic jumble sale I was running for much needed funds. And promptly sold unknown to me for pennies to delighted customers ever ready for a bargain.) Which left me without spare socks, shirts and underwear for some considerable time on wages that did not lend themselves to replacing half of my limited wardrobe. It was my first experience of living on my own, though various youngsters used my house as an emergency abode when they rather than I deemed necessary. A hectic, disorganised period of my life but in the main good fun in a novel sort of way. Definitely a house but being my first attempt, home in a bizarre sort of way. Today's Times includes the story of the airline passenger who, travelling from Tel Aviv to Paris with five children, his wife and eighteen pieces of luggage, managed to leave one of the children behind. One's immediate reaction is to be horrified at such incompetent parenting but is that necessarily fair? 'Let him who is without sin' and all that springs to mind. I remember as a proud father of a two year old visiting the local pub with two friends for a convivial couple of hours. Only to remember after the first pint that we had been left in charge of the infant who was fast asleep in bed, blissfully unaware of our wilful neglect. All three of us were teachers at the time but still hopelessly inadequate beings it seems. Our wives were unimpressed with our dereliction of duty and we were all reminded of it for many a day. As a teacher also I remember taking, with twenty other staff, five hundred secondary school pupils in eight non too luxurious buses to Drayton Manor for an end of term treat. (Alton Towers declined to accept such numbers on one trip and I don't blame them.) We returned with four hundred and ninety seven. The missing three returned under their own steam some time later. It was all very reminiscent of the 'Albert and the Lion' saga though with a less serious ending. Ironically one of the three tragically drowned in a local river days after the school term ended. I remember too as a youth leader returning from Blackpool to Derby after a youth club outing minus one young lady. I had to knock on the door of her parent's house and explain we had lost the daughter they had lovingly brought up for the past sixteen years. Not funny, I can assure you, even less funny when she arrived home hours later, having found a 'young man' on another trip from Derby and travelled home with her new found friend on their bus. Contrary to what people might think we were and hopefully still are conscientious if sometimes flawed individuals. But times have changed and in this 'Madeleine McCann' era woe betide any mistake by those in charge, be they parent or teacher. Sometimes, just sometimes I'm glad I'm just an old fool whose main occupation in life is merely watching the world go by. Or is it only me that did daft things; you tell me. Every waking moment is taken up by the move. Trip after trip after trip, the new bungalow will only take half of our belongings. Choices have still to be made, hard, sometimes anguished decisions as to what to keep and what to part with. With no end in sight, trying to stay positive with out screaming. But never fear, we'll get there and, you lucky people, the new football season is just around the corner. Only joking, honest, I do realise football is anathema to many, and I confess, it doesn't seem five minutes since the season ended. Derby is very much a footballing town and Derby County were one of the twelve founder members of the Football League in 1888. A friendly game on Saturday prior to the start of the new season included in the Derby County team the names Pereplotkins, Albrechtsen and Kazmierczak. How times change.There will be over twenty five thousand people in Pride Park at the first game on Saturday versus Doncaster Rovers including my wife and myself. The majority home supporters of a team that won only one game last season and ended with the worst result ever in the history of the English League. 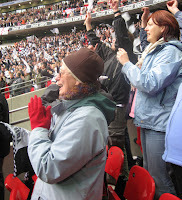 I have be en a Derby County supporter, man and boy for over sixty years. The old ground, the Baseball Ground was an infamous, dilapidated, wooden and corrogated iron structure, with a pitch reminiscent of a ploughed field and offering minimum facilities and maximum discomfort. Two or three years ago I wrote a short, somewhat nostalgic story entitled The Autograph Album. (One of the stories in 'There's Nowt so Strange as Folk'). The story may be fictional but the memories are real; happy days. They told me you were coming. You want to interview me about me album, now why would anyone be interested in my football memories? You’re new to reporting, you say. You have to fill a little column once a week and you get all the jobs experienced reporters don’t want. At least you’re honest, lass, so what do you want to know? Do I mind if you record what I’m saying as we go along? No me dear, as long as it’s not going on the wireless, I’d feel daft hearing misen talk. When did I first go to the football? Well I were born in 1939 so I’d be eleven in 1950. It would be any time after then I suppose. I used to stand in the Boy’s Corner behind the goals. Boy’s Corner, mark you, no mention of girls in them days. Big boys, little boys, all ages, shapes and sizes, but I don’t remember any girls. Not that I’d have noticed, the football were more important. Three o’clock, every other Saturday, two fifteen in winter. No floodlights in them days. Then at the end of the match queuing for autographs outside the player’s entrance. And sometimes at the railway station if the teams travelled home by train. We were often cold and wet, but we didn’t mind. Now here’s me album, where shall we start? Let’s see, who played for my team, Derby County. Jack Stamps, Albert Mays, Bert Mozley, Ray Straw, Ray Middleton, Cecil Law. Reg Harrison. My, how they bring back memories. Jack were an old fashioned centre forward. Went blind in later life, they reckon it were from heading those old leather footballs. Albert ran a snooker hall after his football career ended. Bert, the first footballer I ever heard of who wore contact lenses. Saw him once looking in the mud after one came out during a match. Ray Straw, not too sharp, Ray, to put it kindly. See his autograph, you can only just read it. Mind you, he scored more goals for Derby County in one season than anyone else, thirty seven; a record that’s never been beaten. Mr Middleton, now he must have been bright because he became a JP. How many footballers do that? And Cecil Law, now he were Rhodesian, and there weren’t many Rhodesian footballers in them days. Not too many now, come to think of it. Reg Harrison, played in the Cup Final in 1946. There’s only him and Jim Bullions left from that team. Over eighty now is Reg. Still walks to the shops for his paper. Takes him ages, everyone insists on chatting. And he still goes to Derby County matches with his wife. A very popular man is Reg. Do I remember all of the players in my album? Remember them all, good heavens, no, lass. In fact half of them you can’t even decipher their names; they were footballers, not scholars! And funnily enough, I don’t remember seeing individual players who were household names. Yet there they are, in my little book, as Arthur Askey used to say, “Right before your very eyes.” Whose Arthur Askey, did you say? Oh dear, I’m really showing my age! Can I give you examples of players who were household names? Now let me see. Here you are, Wilf Mannion, and Tommy Lawton, oh, and here’s another, Len Shackleton. Wilf Mannion were a slightly built man who were a wizard with a football. Played for Middlesborough and England, one of the best ever. Funnily enough, I were introduced to him in a working man’s club in North Yorkshire when he were in his seventies. He were ever so interested when he knew I came from Derby. A frail old man who had made no money from a game he had graced at the highest level. “I remember Derby County well.” I remember his eyes lighting up at his memories. “How’s Jacky Stamps?” he’d enquired. “Oh Dear.” A short silence followed. “Chick’s been gone a long time, Mr Mannion.” I remember squirming with embarrassment, but Mr Mannion were oblivious to my discomfort. “He’s gone too.” I hated to have to pass on such depressing information, but we were, after all taking of an era long since gone. Mr Mannion returned to the housing complex he called home and I returned to Derby. Not long afterwards I read a glowing tribute in the Times in memory of the late Wilf Mannion. Tommy Lawton, now there’s a famous name if ever there were one. One of the best centre forwards who ever lived. Here you are, see, playing for Brentford. Who are the others? A J Bloomfield, a Cliff Jefferson and a Bill Dare. How lucky they were to have played in the same team as Tommy Lawton. And what a privilege for me to have seen him. You’ve no idea what that means to me, my dear. And do you know how he ended up? So poor that he were caught shop lifting to make ends meet. His old club, Notts County had to play a match so that the poor man didn’t starve. Bigger than pop stars, they were, yet paid a pittance. Len Shackleton, now there were a character if you like. A brilliant footballer, played for Sunderland, and wrote a book about football after he finished. One chapter were about what football directors knew about football. Left it blank, he did. He were his own man, were Len. Are you getting bored, my dear, for you it’s all so long ago. Can you look through the album, of course you can. What do you say you’ve found? A B G Palmer, Hasland 18c. What did you say, he doesn’t sound like a footballer. You’re quite right, my dear. One day I lost my album. Distraught I were, I’d no idea where I’d lost it. I weren’t half upset. Mr Palmer were a railwayman who picked my book up on Derby Railway Station and posted it back to me. Thank you, Mr Palmer, you made a small boy very happy. You’ve found another? Let me see. H Gartside JP, Chairman of Oldham. As Tommy Trinder would say, “Now’ there’s a funny thing!” Who’s Tommy Trinder? Don’t even ask! Strange that a football chairman would want to sign a small boy’s book. I reckon he were right proud to be chairman, don’t you. Strange too that a small boy didn’t know the difference between youthful footballers and ageing chairmen. Why did we collect autographs, you ask. I don’t rightly know, if truth were known. In search of heroes, I reckon. Role models if you like, only such terms hadn’t been invented in them days. A bit of excitement, what do they say nowadays, getting a piece of the action. Famous players, famous teams, the stuff dreams are made of. Cardiff, Swansea, Oldham and Chelsea. West Bromwich Albion, Bury, Birmingham and Bolton; Blackpool, Burnley, Stoke and Charlton. Such wonderful teams, with marvellous players. Sam Bartram, Willie Watson, Malcolm Allison, Davie Drurie. To you, nothing, to me, magical memories to savour on dark winter nights. Nat Lofthouse, nicknamed The Lion of Vienna because of a wonderfully brave performance for England against Austria, one of the finest teams in Europe. George Robledo, a South American player for Newcastle when most players were home grown, and Lindy Delapena, a Middlesbrough player and the first black footballer I ever saw. What were it that young girl used to sing, “Those were the days my friend.” What were her name, Mary Hopkirk, something like that. Is my autograph album worth anything, you ask. I suppose it might be. Would I sell it? What do you think. It might be dropping to bits, but it’s still my most prized possession. I hope I’ve been of help to you. Thank you for coming. Do you like football yourself? You do? And who do you support? Manchester United! Oh dear, oh dear, oh dear!